The slogan, "Can you rap and snack at the same time?" Can you talk with your mouth full? Then, yes, probably. The slogan, "Education is knowledge." Um, first of all, duh; but second of all, the cooler you try to make education sound to kids, the more it's going to backfire on you. MC Potato; What, was LL Cool Ranch taken? How about Ranch Flavor Flave? 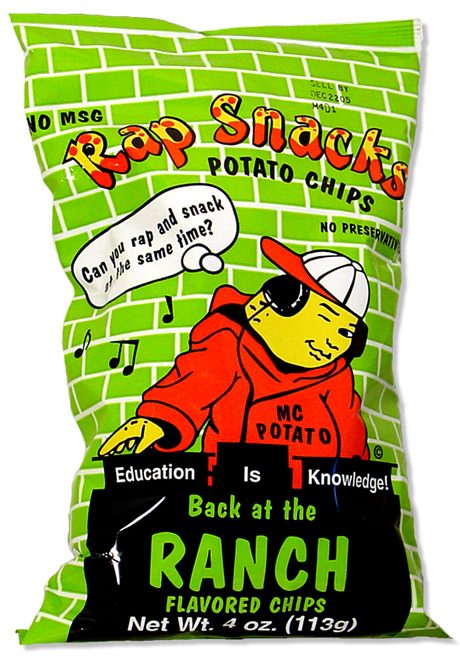 NO MSG: trust me; if you're eating rap flavored chips, you probably don't care. The incredibly amorphic, asexual and aracial blob of a graphic that is spinnin' the discs. Let me know if you think of any more!